So, I did indeed brave the sunny, warm weather (which did not tax my sinuses half as much as yesterday) to chase a few shots, mostly by heading down to the river for a short while. I was primarily aiming to do some infra-red experiments, and did, but I took advantage of other conditions while I was there. 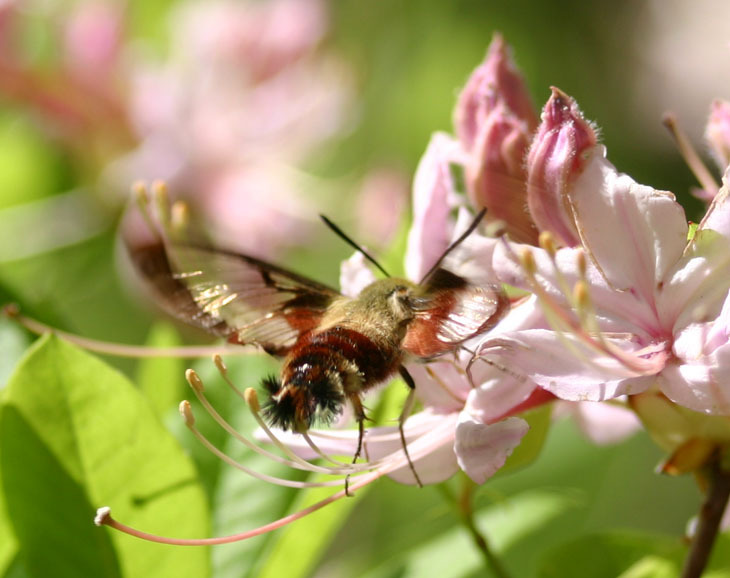 Above, a common clearwing moth, also called a hummingbird moth (Hemaris thysbe) dives deep into a pinxterflower (Rhododendron periclymenoides.) These little buggers presented a difficult target because of their constant motion – they feed quickly and never land on the flowers, and I’m still after some really solid images of them. Quite likely, what it will take is setting up the camera in an ideal position just behind and over some choice blossom, and simply waiting it out – multiple flash units are probably a good idea. Several of these large bushes/small trees were in bloom, and attracting no minor amount of attention, mostly from the Eastern tiger swallowtails (Papilio glaucus), who let me achieve some pretty close approaches and held reasonably still, unlike the clearwing moths. 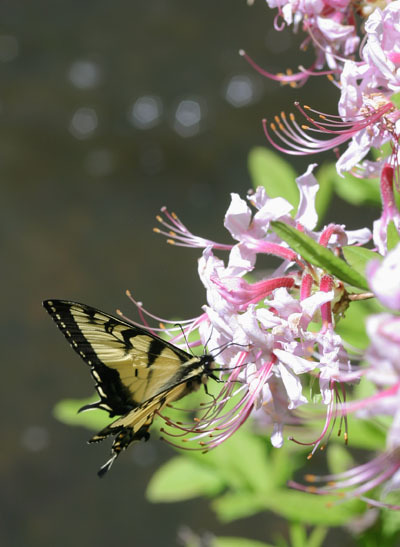 There were a few small squabbles, potentially mating behavior since it took place between yellow and black versions of the same species, but otherwise little display of territoriality was visible at all, with swallowtails and clearwing moths occasionally feeding from neighboring flowers. While I stood nearby, two clearwings and a swallowtail came over to check me out at close range, but only briefly – I’m guessing the denim shirt (it was pretty chilly today) wasn’t all that appealing. No, I don’t own any Hawaiian shirts, and never will. 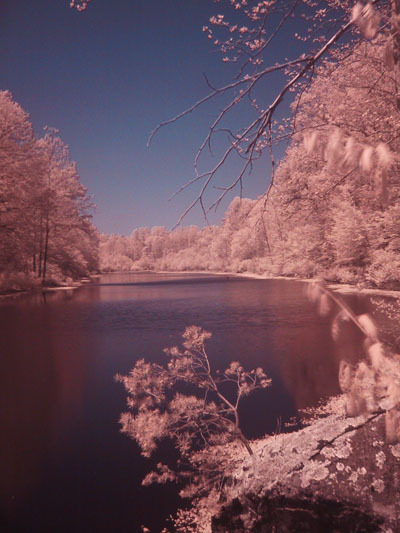 And this is the effect from a different filter, a 720nm IR (which includes a small portion of the light visible to us) and probably my favorite. 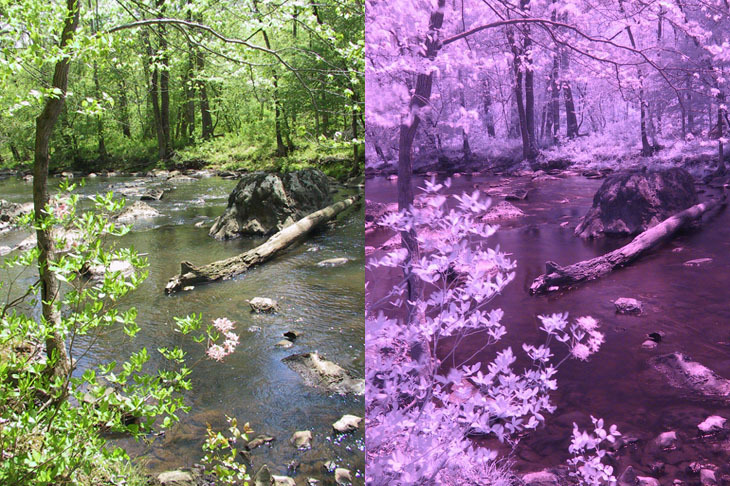 Shown in comparison to an unfiltered version, you get an impression of what reflects IR light. Foliage usually shows only subtle differences, no matter what the color, and even dead leaves are quite reflective. Trunks, however, are considerably less so, and water does little reflection of IR. Blue skies contain almost no infra-red, so skies can become very dark (again, some filters allows a certain amount of visible light through and may give some sky color, like the slide film further up) and without the reflection from the sky, water becomes more clear, as can be seen around the base of the rocks – obviously IR is still penetrating, and bouncing back from the rocks within the water. Notice how the water has a distinctly magenta hue while the foliage turns towards cyan. And finally, an effect I rather liked, this time using the Lee #87 polyester IR filter, which is claimed to start transmitting light above 730nm; in comparison to a 950nm filter that I have, I’m more inclined to say to it peaks at least as high as 850nm – the exposure times aren’t as long as the 950, but close, and the color transmission is almost as negligible. What you’re seeing here is the spillway out of the lake, between the two images above. 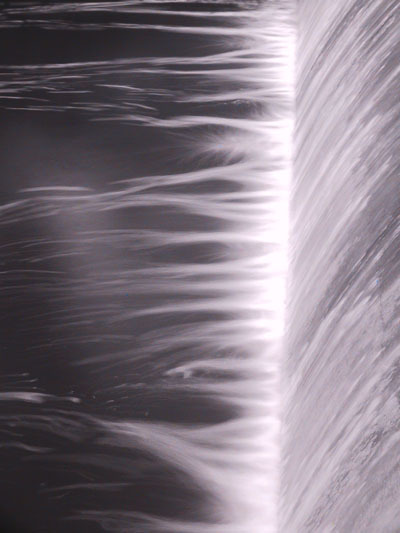 The eight-second exposure aimed down from above the wall captured the froth at the bottom, moving enough to simply become blurred trails across the surface. There wasn’t much color to begin with, but this filter eliminates most of it anyway. The light needed to be bright, because without the reflected sunlight the bubbles would barely have registered, not staying in one place long enough to impinge on the sensor very strongly. 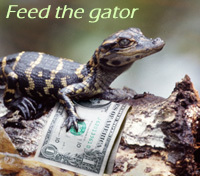 You can also go to this post if you want more info on shooting IR. Generally, unless you want to have a newer camera professionally modified, it’s better to find an old digital that lacks the IR blocking filter. Hope you got out today, but if not, there’s always tomorrow!